I feel like I’m going crazy, but wasn’t there a strip showing Ain after he left the mountain before this? There’s a panel in the big summary strip "There will be a test…." that shows Ain living in the Goblin lands not far away from where ex King Karak and his family live. Thank you–I was afraid I had really slipped something! Don’t worry. Truth is, I did that strip for myself more than for you guys. It’s good that an artist & writer continually seek to test himself. 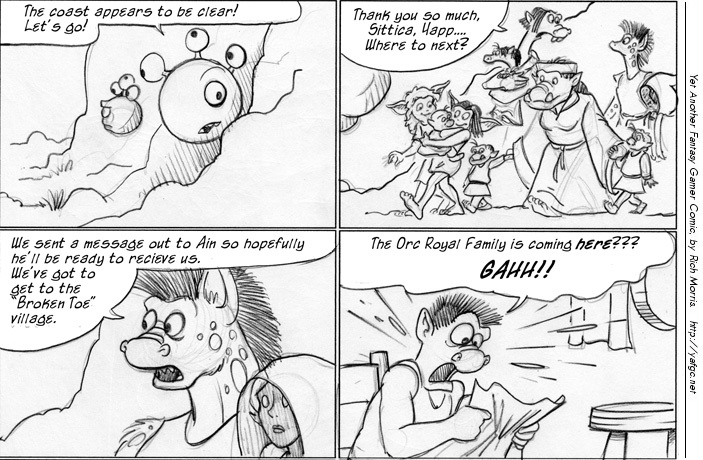 Well, since the plan to take them to see Ain was only formed in the last strip, they’ve only had a few hours to get it together and flee the mountain. The message Yapp sent could only have been brought by some kind of courier at most a few hours ahead of them. Ain’s message has something like: "….. oh and by the way, we’re bringing the Royal fugitives to stay with you. We’ll be there by sometime this evening." Who doesn’t know the moment you realize you suddenly have x time to clean up before visitors come? I wonder how that’s affected by the fact that the visitors are royals? Wasn’t Broken Toe also where Goria and Jone were hailing from? This could be an opportunity to rekindle some Goldkeeper relations. Probably not with the brother who kicked Goria out, but there might be other family members. And once again, the multi-directional eyes are hilarious. I have this image of Bob suspended in mid-air, upside-down, functioning as a spy satellite. There is a sub-species of beholder-kin called the Spectator, who are actually guards. And relatively benevolent for beholders… until you try and touch the stuff they’re guarding. Is Gren looking a little, um, _broody_ in the second panel? Or just being a doting ‘Auntie’?